Turning Head Antennas with a continuous azimuth travel range of up to 240° are available. Full Motion Antennas with or without a third tilting axis are used for LEO/MEO/HEO applications in S/X/K-band and such as remote sensing, whereas the Turning Head Antennas are usually required in high power, single-station ranging or TT&C facilities. Antennas with reflectors up to 35m in diameter are available. Both antenna types have backlash-free drive systems and accomplish very precise pointing and tracking tasks. Feed systems and electronics for nearly all frequency bands can be supplied. 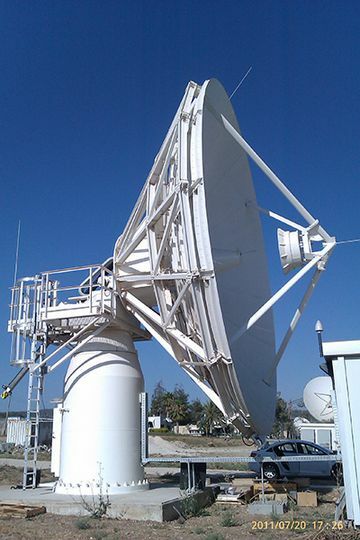 Monitoring & Control systems developed by VERTEX ANTENNENTECHNIK are used to remotely control complete ground station facilities. Turnkey solutions, which include the entire RF system with TM/TC/ranging processors or high-data rate receivers originating from any third party can be provided.